Vijay Jawandhia is a farmer in Vidarbha, the region which brought home to us the crisis that is compelling farmers to kill themselves. He is also a leader of farmers. Recently, he spoke of new challenges: "In my village we are hiring vehicles and bringing people from cities to work in the field." Sounds bizarre but news stories from across farming regions suggest a similar trend. What does this mean for food security? The fact is labour shortage, in part, is about the wages farmers can pay. It is for this reason the National Rural Employment Guarantee Scheme has often been accused of taking away labourers from farms. But the scheme pays a subsistence wage at best for the hard work of digging ponds and breaking stones. Nonetheless, it provides alternative work, thus, improving the bargaining power of farm labourers for wages. Furthermore, if the assets—ponds, check dams, soil conservation structures and roads—being built under the scheme are indeed built, they will improve farm productivity and incomes. It is another matter that as yet the quality of rural assets is poor because the scheme focuses on jobs, not work. The reasons for the growing shor tage of farm labourers are not understood adequately but implications are obvious: there will be higher prices for farm work. As market economists will tell you this is good news, for it will increase the income and purchasing power of the poorest in the country. Along with the increasing prices of other inputs, like seeds, fertilisers and water, higher wages will make growing food more expensive. Market economists will also tell you that this will place more money in the hands of poor farmers, themselves consumers of food. So everyone will grow richer. This is begging the question. The bulk of Indian farming—over 60 per cent—is rainfed. 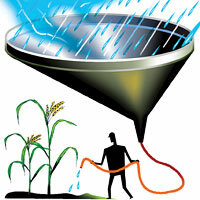 Farmers have no option but to depend on an increasingly erratic rainfall. They grow crops for subsistence; their very existence is threatened. One poor rain or flood can push them down the vicious spiral of poverty and destitution. They cannot afford expensive food. So, there is no easy way ahead. It is time policy-makers recognised two critical facts. One, that growing food will cost money and two, that we cannot afford expensive ways of growing food. If the western world has flooded the food market, it is not because their ways of farming are more efficient or their farmers are more learned, but because their governments pay obscene amounts as subsidy to underwrite the costs of growing food. The European Union doles out US $51 billion each year to its farmers to keep them in the market. European sugar farmers—whose produce our government imports often— are paid four times the world market price. Then the surplus is dumped in world market using an additional US $1 billion in export subsidy, which depresses global prices. The situation in the corporate-run US farms is similar. In India, policy must be designed to increase the minimum support price so that farmers are paid for the costs they incur. Today farmers invest large amounts of private capital into building the infrastructure for their operations unlike any private company or industry. They pay for building irrigation facilities—more than half the irrigated land is groundwater-irrigated. Some 19 million wells and tubewells have been built with private capital. This cost must also be accounted for in the food bill. But as yet, policy has been caught between a rock and a hard place. On one side are poor farmers who need to be paid for growing food. On the other side are vast numbers (also farmers) who cannot afford the price of that food. As yet, the policy has been to subsidise food, not pay farmers. The public distribution system is designed to buy vast quantities of food grain and supply it to people. It depends on keeping the price of procurement as low as possible. That's what the minimum support price is all about. This will not work in the future. India will have to design policies to pay farmers the real cost of growing food, and to pay them directly. This means revamping the fertiliser subsidy, which pays companies to make fertilisers, not farmers to buy it. The challenge of reaching cheap food to vast numbers still remains. That's why the policy must recognise the need to cut the cost of growing food as well. We are obsessed with crop yields, not realising that high-input farming is based on just one principle: increased cost of production. This can work where consumers are affluent enough to pay the price or governments are rich enough to subsidise farmers. It will not work in India. India has to find ways of valuing agriculture, which is low-input but gives relatively low yields. It is here that policy must be innovative. We must invest big time in marginal agriculture. This means doing watershed development to recharge groundwater and decentralised water harvesting to improve irrigation. This also means better seeds and procurement of locally grown food at good prices for food distribution programmes. This will build local food sufficiency. These are game changer steps. Let's try them for once. 1. The fund alotted to the scheme is wasted. The workers go to pond, stay there for half day, wait for evening, get their salary and go away. The actual quantum of work is not completed. They get paid, without much contribution of labour. 2. They get food materials at subsidised rate through ration shops. So even if they go to work for one day outside they get around rs.200 to rs.300 and live happily for one week - result they become lazy. Next generation will not learn farm works. 3. So land owners depend on mechanised farming. If govt stops sops due to financial crisis, these workers can not find work even in fields, as there are machines to work. Even if they get few work, they can get lesser wages only. 4. If land owners use machines and refuse to engage these workers, there will be revolt - and this is the naxalism - govt makes workers lazy and makes them not to learn work and probably future of agriculture is in danger. 5. It is upto the govt to utilise the funds in such a way that both farm workers are benefitted and agri yield also increases. As usual, Sunita Narain is brilliant in her analysis of the Food-Price spiral. Unlike the jargon dished out by eminent economists, Dr. Narain succinctly outlines the ills effecting our Agriculture. For once, a lay person like me understands why the goldilocks era of cheap food is over. As always a valid subject visited by Sunita ji and well commented by Chandrasekaran ji. The excessively secure comfort zone that all those entrusted with management of the country's affairs enjoy and immunity to questions of rationale even on gross dereliction by all and sundry has over the years developed an atmosphere where each one is an individual and at best living for self servicing since, money alone gets respected. How? is becoming increasingly inconsequential!!! This we must all agree is not a good example for the next generation. Result: Fertile lands get converted for SEZ or industry or real estate all the while adding further to the black money. Younger generation amongst farmers is happy to sell lands and indulge in luxuries that is mostly available to politician's or contractors or middlemen. Thus we are heading into a situation where a manufacturer wants to turn into a trader so how can the farmer get spared. Very true, as time progresses we are loosing value for the basics and roots. Can we really blame the young farmers for not being attracted to easy money? have their lives been easy at any point in terms of numerations they received from the govt in times of need. Or any incentives for increasing productivity or adding value to their work and toil. The young urban generation is also no better so i guess we are all heading to self destruction, quiet negative but true.